Double checked and it doesn’t seem to be functional. Is this the right knob or am I looking in the wrong place? If it works I’d really like to use it because it’s hard to use voice comms with the dang thing blaring all the time. So that knob is nonfunctional, look at the left panel where you set the AIM-9 tone and ICS volume, there is an RWR volume knob there, that one works. Thanks! And here I thought the volume panel was the nonfunctional one. yeah I’m not sure what the audio control knob on the ALR-67 is supposed to do, since it doesn’t say volume and is nonfunctional I’d assume it has some other functionality, no idea what though. Bass + Treble like a car stereo, I’m sure. I’d still like the filter knob to work, though! After the datalink, SA page, and TOO mode for HARM this week, we then plan Latent Track While Scan (LTWS), JDAM, Aircraft/Mission Card, and some bugs fixes for the 13 March Open Beta. This is an estimate and not a promise. As has been mentioned before, the engineer assigned to the HARM is also assigned to the targeting pod. So, once HARM is done (PB and pullback modes), he will work on the TGP. 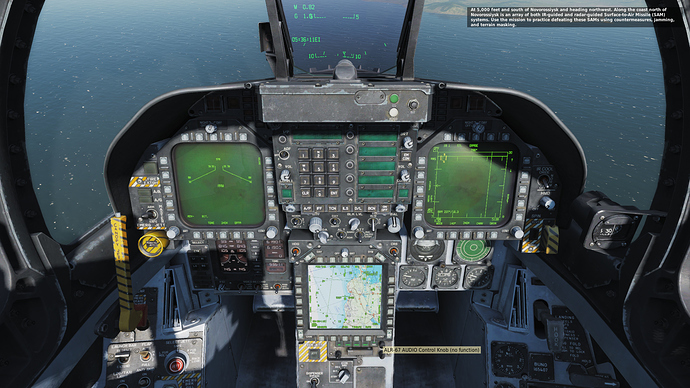 Also, in the very near future, we plan to revisit the Hornet flight model, the JDAM flight model (INS-GPS autopilot), and other weapon Launch Acceptable Region (LAR) profiles. Didn’t think that would happen in my lifetime. Good to hear. Can you elaborate as to what you all feel needs to be updated or improved in this area? Should we be expecting at some point that the ability to land the aircraft without damage at some pretty high sink rates will be tweaked? Can you elaborate as to what you all feel needs to be updated or improved in this area? I wish it dumbing everything down to the point where I can get back aboard the boat without fireball…but probably not. @Franze hopefully they mean pilot’s flight model. As in…you can eject when hit, instead of insta-dead. What I don’t understand about the video is how a Mode 4 interrogation alone determines a contact as hostile. Shouldn’t IFF only be able to determine friendly (response) or unknown (no response)? So a placeholder effect for functionalities sake. Based on what he talks about thats not implemented yet, there is an ROE matrix page that you can go and setup that will take various criteria and then update contacts status based on that. For example, You could set different priorities for onboard/offboard data, IE make it so that surveillance tracks that are tagged hostile can meet your ROE matrix. Or if its more restrictive, it requires a NCTR print of a known enemy type, plus negative Mode 4 response, plus it can’t be a Friendly PPLI on the Link, and then it auto tags hostile. Or you can set it that surveillance tracks will not qualify for tagging things hostile, but Fighter to fighter data will. Since it looks like they haven’t implemented that additional stuff yet they are going with essentially a very loose automatic interpretation which is if anything does not have a valid mode 4 reply it is automatically hostile. Real world all this would get you to is bogey, IE Not a friend but unknown if its an enemy. Essentially making a (logical) assumption about how DCS works and the fact that the IFF in DCS is essentially side set not system set, IE all blue jets WILL respond as friendly (unless its a mirage that didn’t turn his IFF on) and all red jets WILL NOT respond, and there is no ambiguity there. If they ever make it so you have to actually turn the systems on in all jets or model the fact that a Su-27 doesn’t have Mode 4 and thus will never show up as friendly even if he is on your team (and vice versa) then it will work. Modern pulse doppler radar, like the APG-73, can “read” some special wave returns like the ones from engine’s compressor blades that are like a “fingerprint” that is typical from any aircraft. The F-18 computers crosses this information with the IFF datas and can give U a good identification. NCTR only tells you the type of aircraft, not its affiliation. Besides, the requirements for NCTR are so strict that in practice it won’t work most of the time. As was said before, they are simplifying a lot of things right now to get it out the door. I’d expect IFF to undergo a lot of change during the next few months. But You can cross this information with the IFF responses…If U identify a MIG 29 and he is “unknown” and U dont have 29s at Your side there’s a very good chance that is an enemy. Isn’t it? That’s where the intelligence guys come in. Is there a chance an Kazakhstani MiG-29 might stray into the area of operations? Where is that Indian carrier full of decrepit MiG-29K’s? Is there anything flying that also carries a radar with a signature that might show up on RWR as 29? Hmmm… Come to think of it… Those AESA thingers, they’re programmable as F, right? Could one fake a signature with them? Make an F/A-18E show up on RWR as a Su-27? I bet you can. It depends a bit on the processing resources available but theoretically yes, to some degree. That’s all in whatever the roe is for whatever conflict you are in. NCTR is usually considered good enough to positively ID aircraft as hostile (cleared to fire) in the real world because that unambiguously tells you what type of aircraft it is. If there are no aircraft of that type on your side then it’s as accurate identification of an enemy as you can get from the sensors available. What you also do is correlate that with other data, is he pointing at me? Locking into me? Does the lock match the NCTR (in DCS, NCTR shows SU-27, locked by a 29 on the RWR) and is he coming from the bad guys side, any two or more of these can be used in combination as an ROE matrix to identify a hostile and confirm what you are seeing. If you can’t do that then you may be able to declare something hostile just based on where it took off from, IE we know they only fly military aircraft out of field x, so any track originating from field x is automatically hostile, no further ROE needed (IFF would still probly be run on it anyways). In DCS the big problem with IFF especially with the hornet is due to the messy nature of fights and the fact that most get visual (within 5 miles) IFF bleedover from transponders can make aircraft in close proximity to a friendly appear friendly (just like what appears to happen in the hornet right now, although it’s not for the same reason). And awacs usually can’t keep track of who’s who anymore and which contact was hostile once they merge. So it’s generally a good idea to hold all shots going into a furball no matter how much you want to help until you can visually confirm, yes I’m shooting the bad guy.